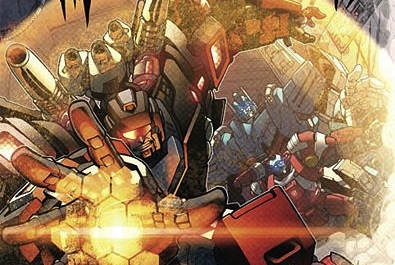 Transformers: More Than Meets the Eye #3 is a bit of a one-off monster story. Our team of James Roberts and Alex Milne get their feet wet with action-heavy writing and art. This story is sub-titled Liars A to D: Part 3, but all that really unites it with the past two issues is the use of an extremely simple plot (monster on a spaceship) as a framework to stuff in character and world building. This will NOT last, as once the exposition given to date can support it, MtMtE takes off with much more complex stories. We start by flashing back to just before the cliffhanger that ended number two. 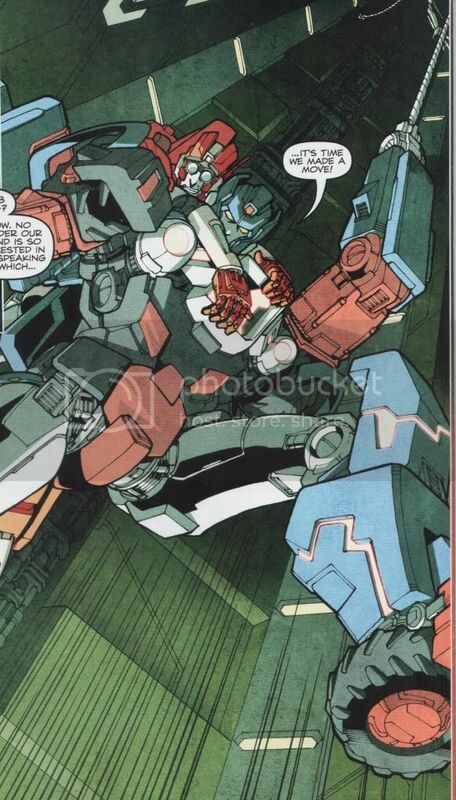 A pair of new characters called the Duobots caused the ship to fly off-course last time by trying to plant a tracker on the ship, at the behest of Autobot black ops guru Prowl. This interfered with the hyperdrive, killing one of the Duobots and releasing the monster, which proceeds to claim the other as he returns to mourn for his twin. Yeah, there’s a lot of irony in this comic, and a lot of pathos in the fates of two robot redshirts. This scene, in true monster-movie fashion, doesn’t reveal the monster’s form quite yet, but reveals that it can telekinetically disconnect a Transformer’s brain and spark, then devour the latter. This monster is a Sparkeater, and it’s bad news. Another Roberts creation, it seems to be a parasitoid like the Alien that has converted one Cybertronian into a mindless predator on others. This issue ups the ick factor considerably, which is impressive considering that every character is a robot. As the characters investigate and discuss their enemy, two elements jump out. First, the use of humor and wordplay make even dense exposition a charm rather than a chore. Some fans find the switch jarring, complaining that Roberts has made each formerly-distinct character into a funny chatterbox. However, it’s such a desperately needed shot of energy for the Transformers brand that any loss is more than made up for in gain. Better to have most characters be witty than most characters be boring. Second, the “rules” of Transformers anatomy are expanded and clarified for future issues. Each robot has a spark, a brain, and a transformation cog, and damage to any of the three may affect the others and kill the person. 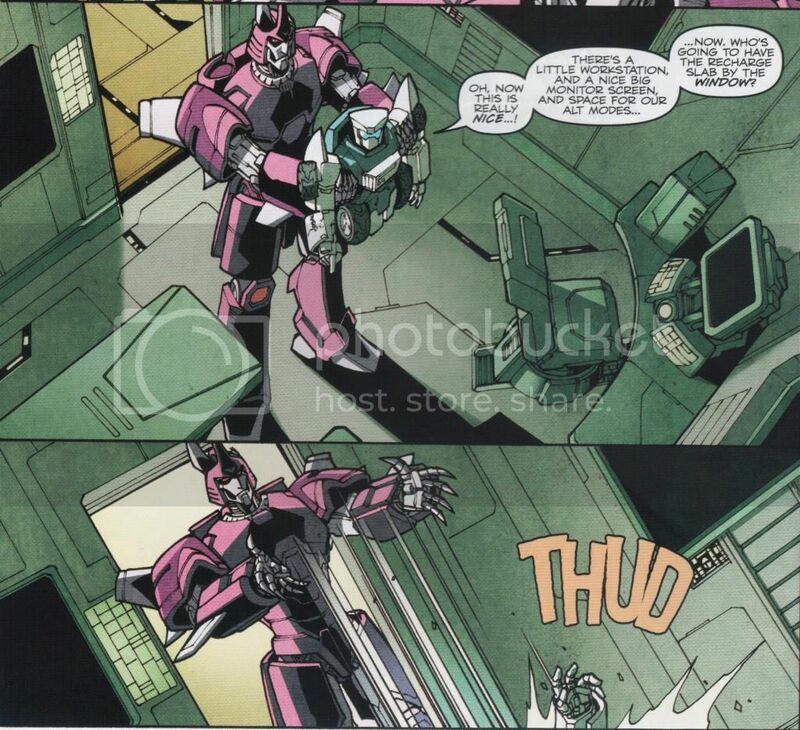 In a cute reference to the play that first gave us the term “robot,” this is referred to as “Rossum’s Trinity.” We also find out what dirty deeds Chromedome specializes in; he can hack into brains, even dead ones. 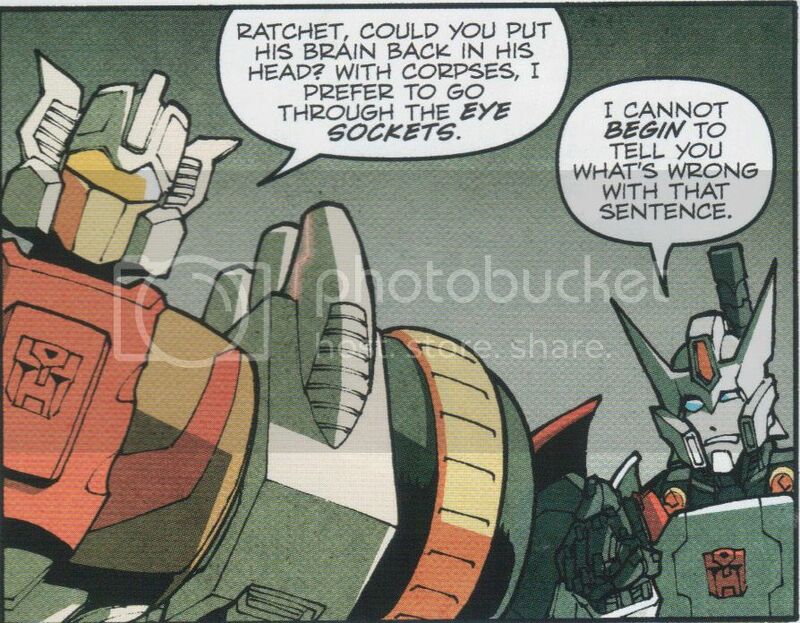 He does so at Rodimus’ order during the investigation, to the horror of his cute and strait-laced partner Rewind (annnnd everyone who’s at all squeamish really). Rodimus locks down the ship to protect the crew and flush out the Sparkeater. 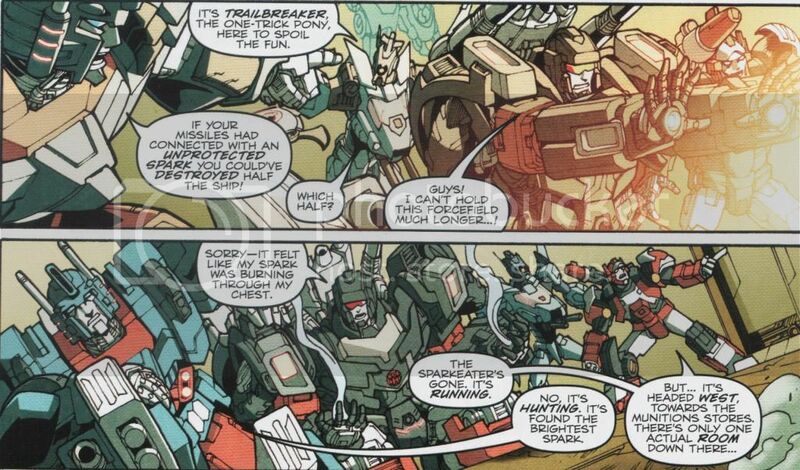 However, the rather unhinged Whirl and Skids independently blast their way out to join the fracas. Appropriately for their characters, Whirl almost destroys the ship and causes the beast to escape a trap; Skids slips around unseen before swooping in for a dramatic rescue. One fun element is that the Sparkeater seeks the “brightest sparks” first. Of course Rodimus—who once held the Matrix of Leadership and is an astonishing egoist anyway—assumes that the beast will come straight for him and plans accordingly. However, the brightest spark on the ship is revealed to be Roberts’ original character, Rung. This plot point invited some criticism from fans. However, it’s balanced by what a fun subversion Rung is of the idea of a “chosen one”—he is useless in robot mode, he doesn’t seem to turn into much of anything, and Skids spends the entire issue carrying him around like a sack of flour. Nonplussed by Rung’s “brightness,” Rodimus even grabs him and uses him as live bait to kill the Sparkeater with another hyper-jump. 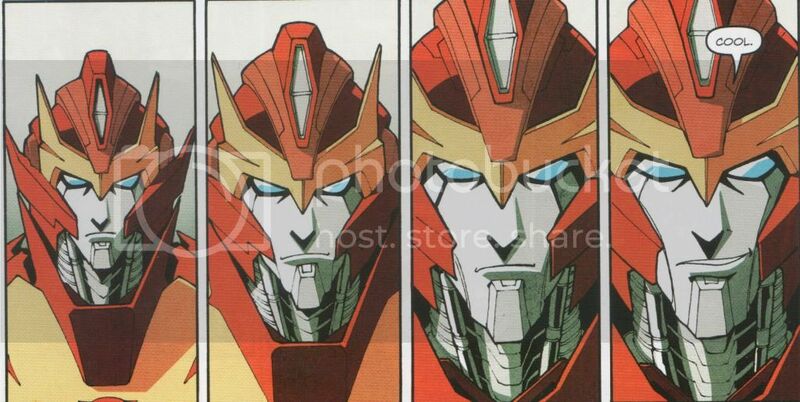 Both Rodimus and Rung are going to continue to be used to deconstruct and, often, just plain poke fun at the “chosen one” concept. And it’s uncharitable to begrudge Roberts one prominent OC when he bestowed personality and purpose upon earlier author Shane McCarthy’s OC, Drift. We also get a lot of great relationship-building in the background. Rodimus is clearly building a bit of a Kirk-Spock-McCoy dynamic in the command crew, with Ultra Magnus stern and critical of him, and Drift intuitive and admiring of him. Tailgate, the ancient stranger, has reached out to none other than…Cyclonus, who before his “evil zombie” days was actually a contemporary of his. Cyclonus actually speaks kindly to Tailgate, though it’s hard to say he’s warming up just yet. All in all, this is a fun book, with a lot of humor and background info. The issue doesn’t really stand out on its own though. It just sort of ends with a “ok, we have the ship under control again and we killed the alien, I guess the story can start now.” But hey, on the other hand it’s nice to read an issue that doesn’t end with a sense-shattering cliffhanger. More Than Meets the Eye understands that, if you’re going to have a huge cast and battle for the fate of the universe, you need to spend time making us care about them first. Check out more of our Transformers comic recaps here!